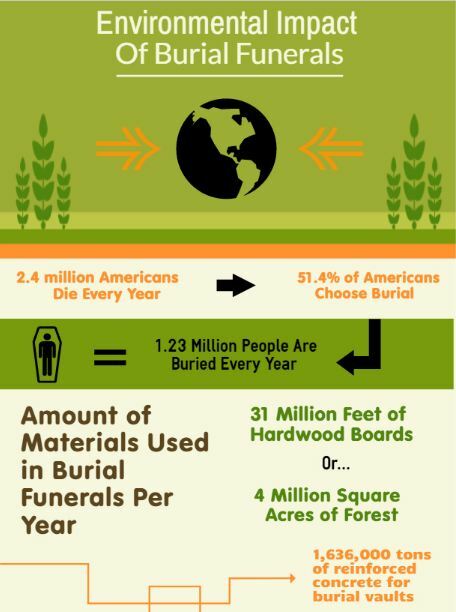 Safe Passage Urns created this infographic to visualize some alarming statistics regarding the environmental impact of burial funerals on our planet. The amount of resources required to create and transport wood caskets is astronomical. The more awareness on this topic, the more likely we are to start adopting more environmentally sustainable funeral practices, such as green burials and cremation. It is difficult to contextualize the actual scope of environmental damage unless you use numbers pulled from national rates. This infographic by Safe Passage Urns goes into some eyebrow-raising examples to illustrate the damage caused by burial funerals. It also sheds light on the number of acres of forest cut down for lumber. There certainly has been a large shift in the funeral industry with more people choosing other disposition methods over burial funerals. As the transparency of information increases, we will begin to see more industries adopt more sustainable policies to appeal to the consumer.